Before I went away last week I went into Sydney city to take two lovely Kiwi ladies on a tour of local quilt shops. They were wonderful company and though we’d never met before we got on like a house on fire. We visited The Quiltsmith, Logans and Calico and Ivy and then I dropped them outside Morris and Sons so they could check out the embroidery goodies in there. As a “Thank you” for showing them around they gave me this lovely apron made by one of them. Isn’t it a clever pattern The fabric shows a Kiwi flower but I don’t know the name, I’m sorry. It also has a badge of the Kapiti Coast Quilters on the top. While visiting the quilt shops I snaffled these goodies. The fabric with the triangles on the far left looks really interesting. Any plans for it yet? I used some of it in the incomplete whirligig. 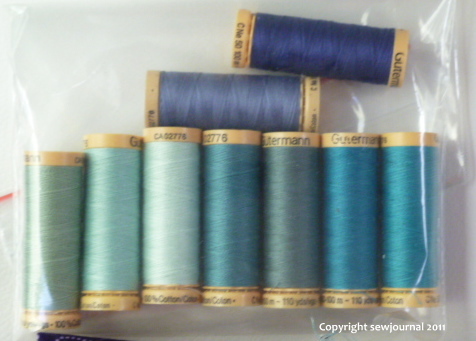 I’m planning a purple and teal quilt and so hope to use this one there. i love the batik on the right… I have a tiny bit of it in my stash somewhere! It sounds like a lovely day out for all. The apron is lovely, the flower is the Pohutakawa and the Kapiti Coast is about a half hour or so from where I used to live so I know it well. Gee I might even have heard of your visitors.